Walt Disney World provided me with two complimentary one-day park hopper passes in exchange for this review. I am a big fan of all things Disney, so obviously all opinions are my own and totally genuine. Also, even though the tickets were free, my husband and I voluntarily spent a lot of money at Disney World over a long weekend. Even though I hope to return to Norway one day, I will never again be 23 and visiting my cousins for the first time. While Dan and I hope to visit Japan again, we also want to visit other countries first. Even if we do make it back to Japan one day, we’ll be in a completely different stage of life, making the trip itself completely different. But some trips can be enjoyed more often. When I was growing up, my family spent a week at Myrtle Beach every summer. I’ve vacationed in Colorado multiple times, both with my family and with Dan. 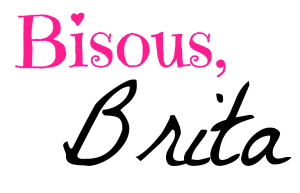 Most notably, I’ve traveled to Paris multiple times, and I plan on returning in the future. 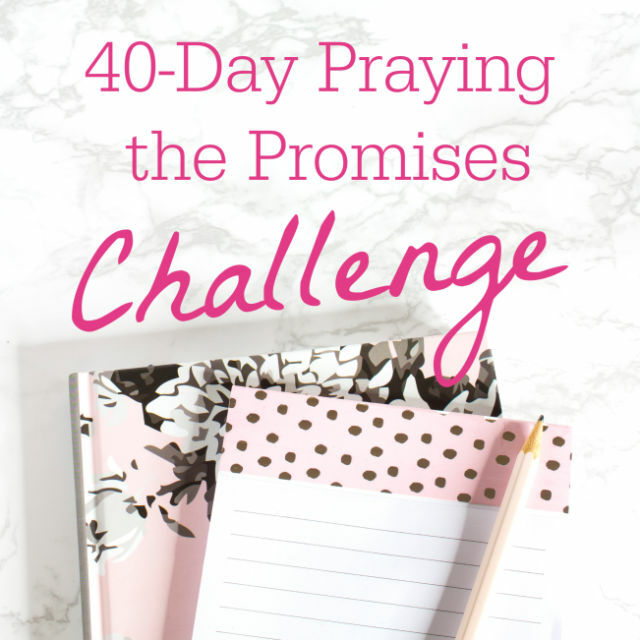 The main difference between once-in-a-lifetime trips and repeated vacations is the cost. Trips that cost more money and take more time are less likely to be repeated. But there’s one expensive American destination that is well worth a repeat visit. It is, after all, the happiest place on Earth. Obviously I’m talking about Disney World. My first experience at Disney World was the only time my family went. My twin brother and I were in the sixth grade, and my younger brother was in the first grade. Our school district had a four-day weekend in October, which my parents stretched to six days. One day to drive to Orlando, four days to spend in the parks, and one day to drive back home. I spent months planning our trip, pouring over the guidebook purchased by my mom. But I was only eleven and didn’t realize the need to make dining reservations far in advance, or the impracticality of park-hopping with two middle-aged parents and a six-year-old brother. Even so, it was a great introduction to my now expert skills at planning Disney trips. Since that first wonderful family vacation almost two decades ago, I’ve visited Disney World six more times. And now, my most recent trip to Disney World. One day split between EPCOT and Animal Kingdom with Dan. If you’ve been to Disney World once or twice before, you might wonder why I keep going back. Like I said, it’s not cheap. What’s the point of paying all that money to do something you’ve done before? Obviously I’m a big Disney fan, and I would visit the Disney parks multiple times just to do everything again, even if nothing changed. But not only is Disney World constantly improving their rides and expanding their parks, they also offer different events throughout the year. You could visit Disney World six times in a single year and still have a completely different experience on every trip. 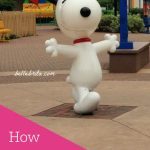 My most recent trip to Disney World was completely different than any prior trip for two main reasons. 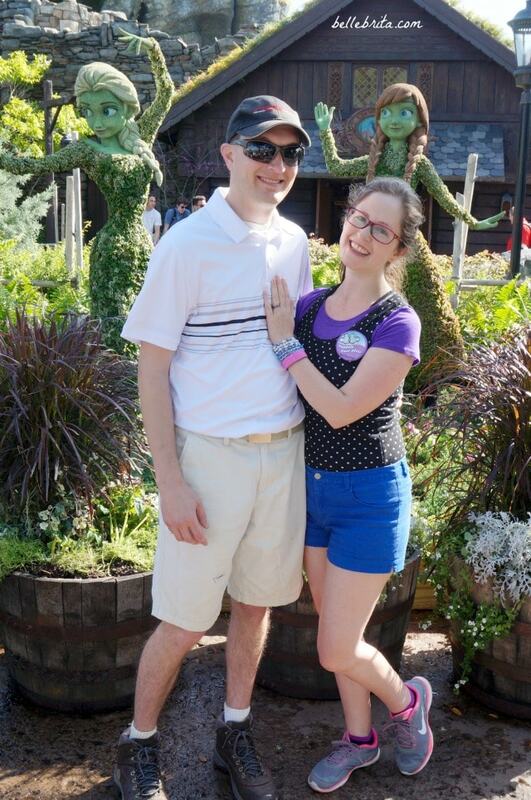 This particular trip to EPCOT was definitely more about the ambiance (flowers!) than the rides, especially since this was the third trip to EPCOT for Dan and me together. We started with Spaceship Earth, which is a classic. Our intention was to ride Test Track next, but it was temporarily closed for technical issues. Dan rode Mission: SPACE while I took pictures of nearby flowers and topiaries. Then we meandered towards the World Showcase, checking out the different gardens along the way. We snacked our way around the World Showcase, checked out more gardens, and then took a bus to Animal Kingdom for the second half of the day. 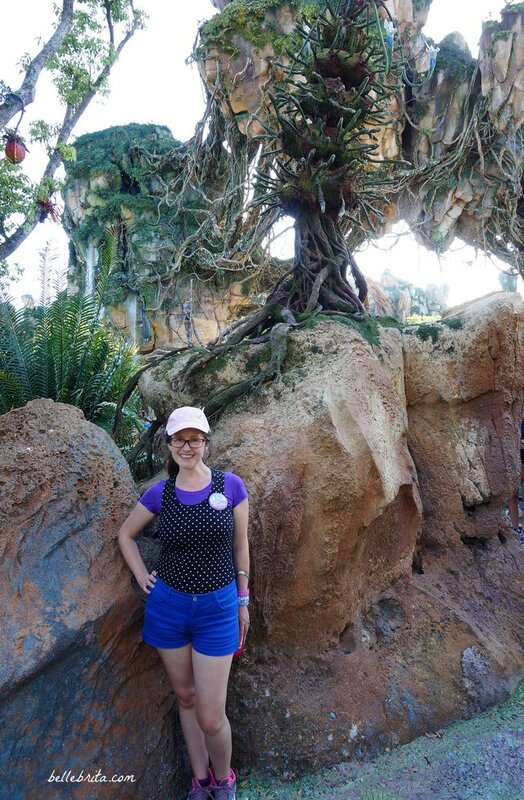 Our trip to Animal Kingdom involved just as much wandering and soaking up the ambiance, but since the park isn’t arranged quite as neatly as EPCOT, I don’t recall the exact order of everything we did. Looking at the map, I think our general exploration was something like this. Everything listed below is a land in Animal Kingdom. And I’m probably missing another Discovery Island stop, since we deliberately went there twice for food. If you look at a map of Animal Kingdom (bottom of the page at the link), you’ll notice that we did a LOT of walking to go back and forth between all the lands this way. But with our FastPasses and the shows I wanted to see, it was necessary. I’ve reviewed everything we did below, just not in chronological order. By the way, we arrived at EPCOT around 8:30am and left Animal Kingdom around 9:30pm. We were staying at Disney’s Port Orleans Resort – Riverside. We were up pretty early for the bus and returned fairly late. 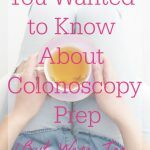 Needless to say, it was a LONG (but amazing!) day at Disney. EPCOT is my favorite Disney World park. Not by coincidence, it’s also the park I’ve visited the most often! I just love walking around the World Showcase and soaking in the ambiance. EPCOT features popular festivals throughout the year. 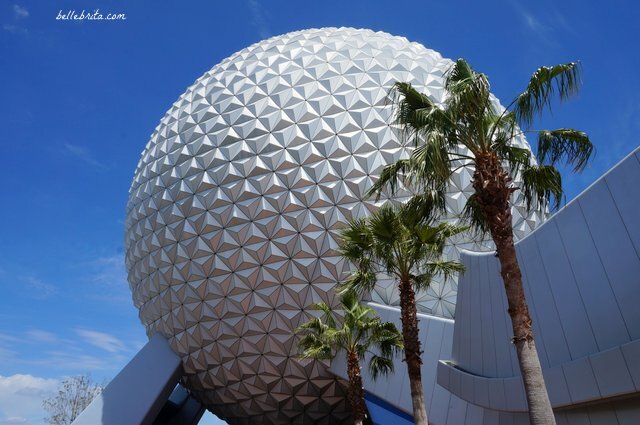 Plus big changes are coming to EPCOT in the next few years! 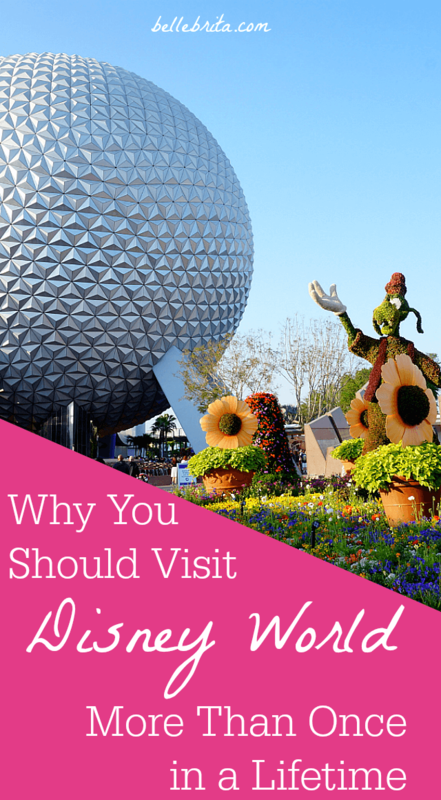 If you haven’t visited EPCOT in awhile, here are a few reasons to go again. Keep in mind that crowds are much higher during the festivals, especially on weekend days. 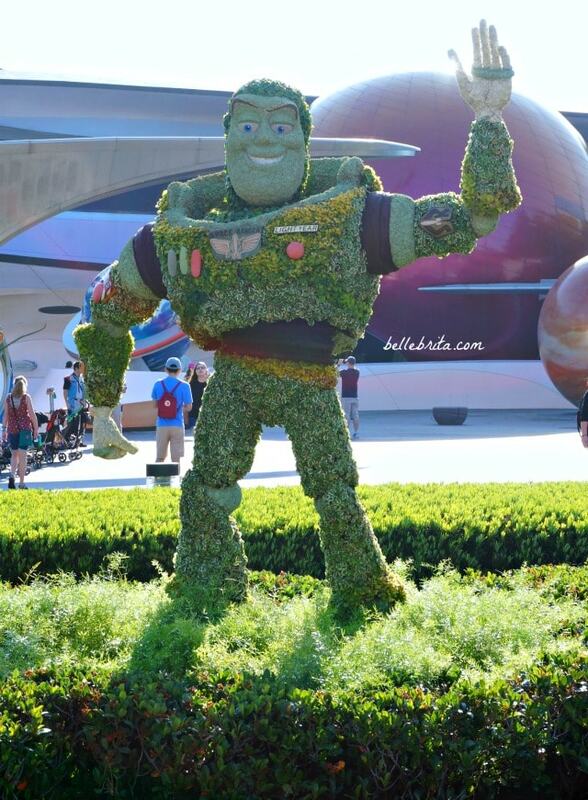 When Dan and I visited EPCOT in March, we finally got to see the Flower and Garden Festival. I love flowers. 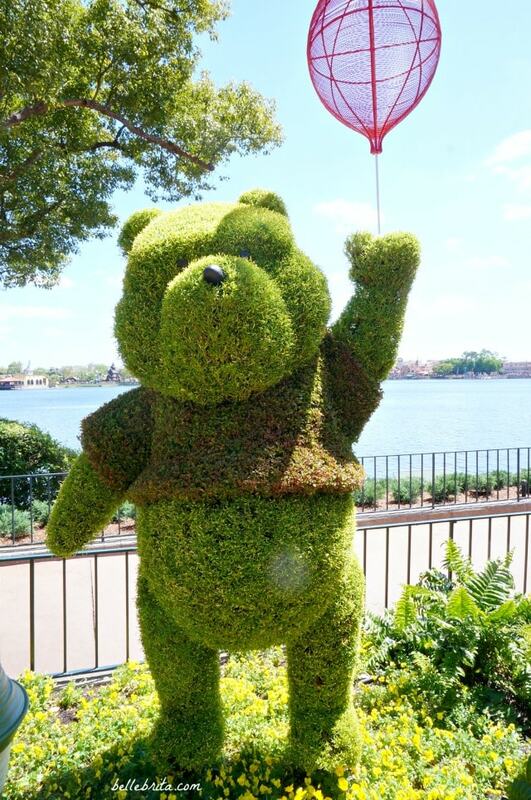 I think Disney’s topiaries are one of the highlights of the parks! 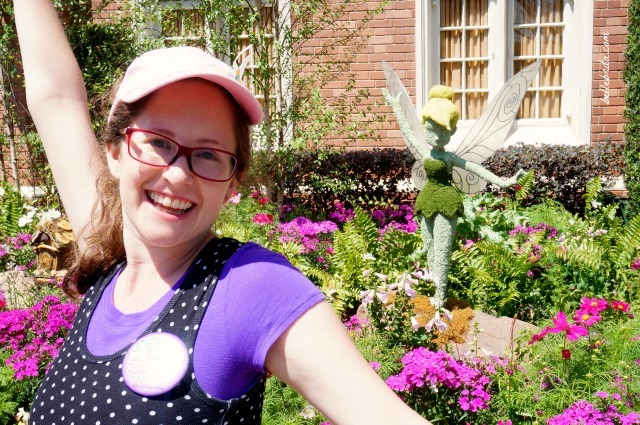 So getting to attend Disney’s Flower and Garden Festival was absolutely perfect for me. 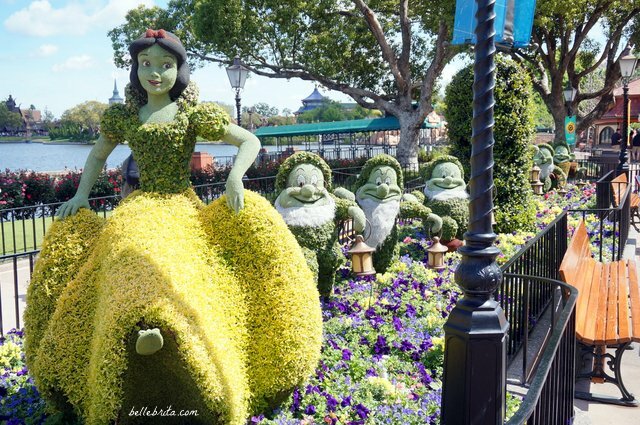 While topiaries can be found throughout Disney World year-round, they pale in comparison to the topiaries during the festival. I don’t think Dan managed to photograph every single one of them–and I kept insisting on lots of pictures! Besides the topiaries, I also admired the many different themed gardens throughout EPCOT. These are just a few of my favorites. The Goodness Garden Butterfly House: I absolutely love butterfly houses! Dan and I stopped in here twice during the day, first at the beginning, and again right before we left. English Tea Garden: Dan and I actually stumbled upon a tour in this garden. The guide welcomed us to join, and we did listen for a bit. It was so cool seeing the different teas growing. Imagination Play Garden: While this garden was designed for children, Dan and I still enjoyed exploring it. 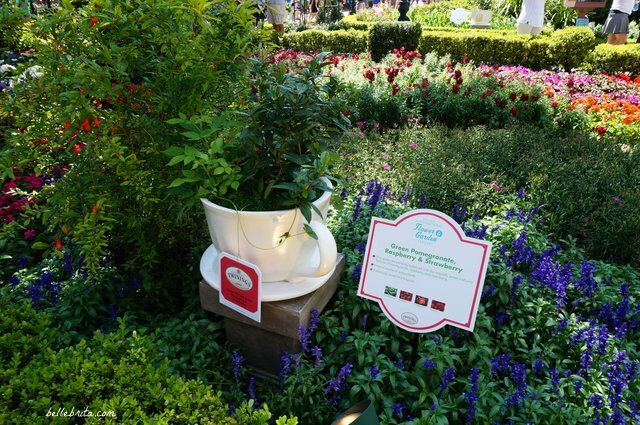 Guests were encouraged to use all of our senses in the garden, including touching and smelling. I liked the variety of scented herbs, plus plants with different textures. This year’s dates were February 28 – May 28, 2018. While Disney hasn’t announced the 2019 dates for their annual spring festival, I imagine it will be March through May. Back in 2015, Dan and I visited EPCOT during the Food and Wine Festival. We ate so much good food! And drank some good beer and wine. If you’re going to splurge on food and drinks in a Disney World park, EPCOT is the place to do it year-round. But the food and drink offerings are especially splurge-worthy during the Food and Wine Festival. For better or for worse (Disney fans disagree), EPCOT has updated or replaced many attractions over the years, with quite a few changes planned in the next few years. My beloved Maelstrom in Norway is now an admittedly awesome Frozen ride. The relaxing El Rio del Tiempo in Mexico is now Gran Fiesta Tour Starring The Three Caballeros, loosely based on the racist 1940s film. More changes are coming soon! The France pavilion is expanding to include Ratatouille: the Adventure, a trackless dark ride debuted in the Paris parks. Finally, a new Guardians of the Galaxy ride will replace Universe of Energy. 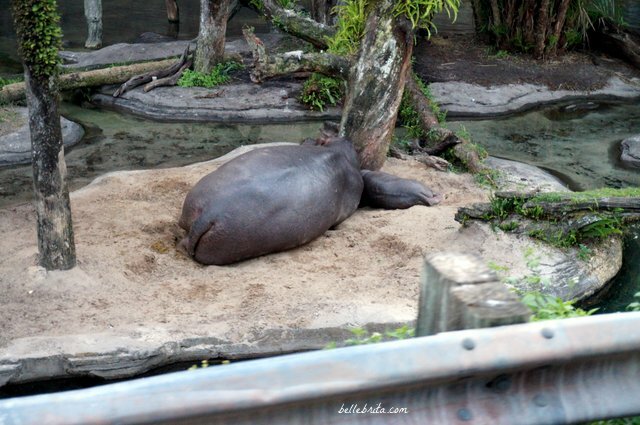 For the last two decades, Animal Kingdom was my least-favorite park. In fact, after my family’s visit when I was a tween, I didn’t return to Animal Kingdom until this year. A lot has changed in two decades–including me and my preferences in a theme park. When I was younger, rides were the main reason to visit any theme park. As an adult, I love to soak up the ambiance. Yes, Animal Kingdom has added quite a few rides over the years, but now I appreciate the ambiance that has always been present. If you haven’t been to Animal Kingdom in many years, you should definitely consider visiting again. This is especially true if your last visit was during childhood, when you might not have appreciated the level of detail at Animal Kingdom. 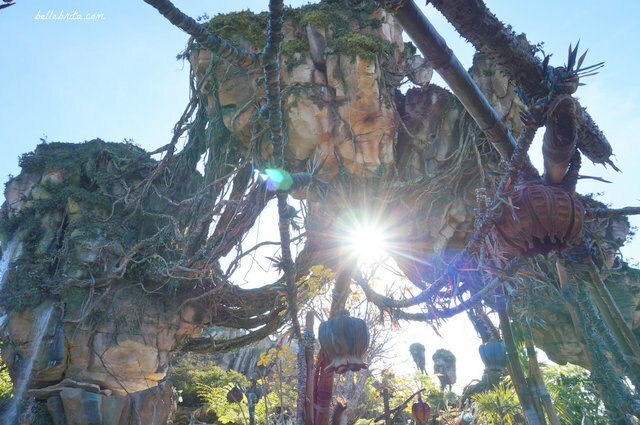 Pandora is the newest land in Animal Kingdom, opening in May 2017. 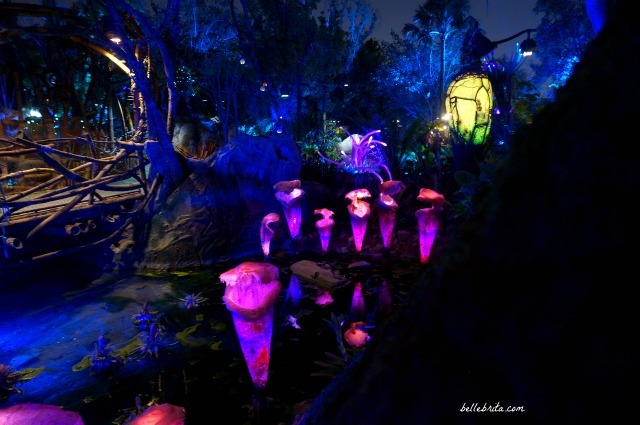 If you love the immersive feel of the different lands in Disney parks, Pandora is a must. It absolutely felt like being on another planet. Pandora also features two rides. Avatar Flight of Passage: An all-new expedition that lets interstellar explorers like you climb atop a mountain banshee for a breathtaking, first-person flight over the moon’s incredible landscape. Na’vi River Journey: Glide down a gentle, mysterious river and feel a sense of wonder as the full beauty of Pandora reveals itself. Luckily Dan and I managed to snag FastPasses for Avatar Flight of Passage since wait times never dropped below two hours. We opted not to ride Na’vi River Journey because wait times remained above an hour. After everything I’d read beforehand, I was so excited for Avatar Flight of Passage… But it didn’t live up to the hype. It’s supposed to be one of the best attractions in all of Disney World, but I think it could have been better. Don’t get me wrong–it was still an incredible ride. I liked the visuals and the movements of my bike-like banshee. But it wasn’t nearly as immersive as all the reviews claim it is. This could be because I was seated on the far end. Perhaps the immersive experience is better with an inner seat. (Eight individual seats all line up next to each other in a single “link chamber”). I could see way too much of the room in my peripheral vision, even as I was trying to focus solely on the screen in front of me. It’s hard to feel like you’re actually flying if there’s an obvious wall to your right. The two Harry Potter rides at Universal did a better job with the 3D effects. That said, if you get motion sick, Avatar Flight of Passage is way less intense than either Harry Potter ride. 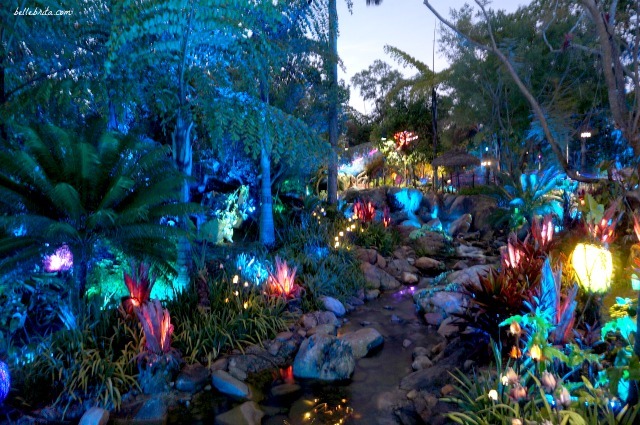 I insisted that Dan and I visit Pandora both during the day and again at night. Based on his stunning photos, we made a good choice! 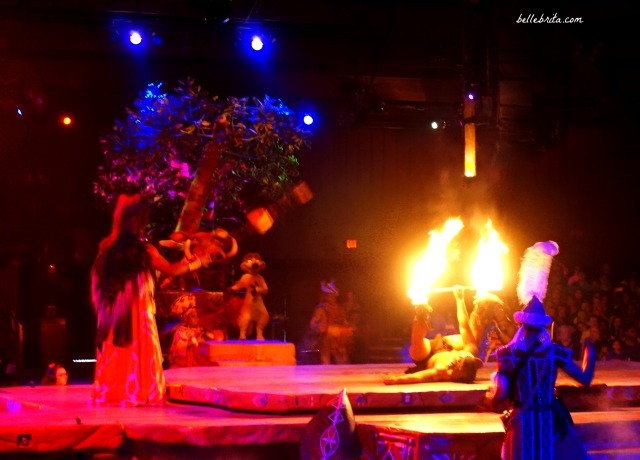 Aside from walking around Valley of Mo’ara in Pandora, my favorite part of Animal Kingdom was the shows. Dan and I watched two musicals during our visit, and both were incredibly impressive. We also watched the two evening light shows, both simply beautiful. Finding Nemo – The Musical: Based on the hit animated movie, this must-“sea” adventure makes a splash with spectacular music and stunning theatrical puppetry. 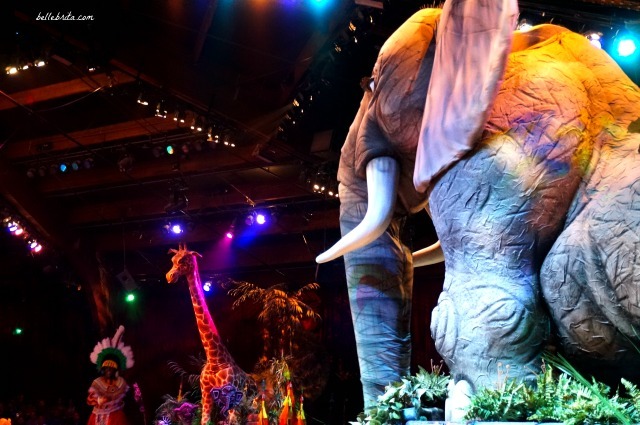 Festival of the Lion King: Delight in the pageantry and puppetry of this big-as-Broadway show celebrating Simba, the lion cub who would be king! Tree of Life Awakenings: Watch in wonder when the animal spirits within the great tree awaken during a mesmerizing showcase of color and light. Rivers of Light: Embrace the magic of nature during a nighttime scene awash with captivating special effects, music and animal folklore. Animal Kingdom also has many other shows and performances throughout the park, including “street entertainment” that you can spontaneously enjoy as you explore the park. Dan and I definitely enjoyed some of the random singing and dancing, but I couldn’t tell you what we saw! Finding Nemo – The Musical is basically a condensed version of the movie, with awesome songs. It was seriously such an incredible experience–and a nice respite from the afternoon heat. Festival of the Lion King was even better, which is saying something. It’s loosely based on the movie, but more abstract. It includes songs from the movie. Performers are a combination of actors in costumes and large puppets. I honestly didn’t expect to be this impressed with the show simply because Dan and I had recently watched the traveling Broadway show of The Lion King. The two performances can’t be compared. Aside from using the same source material, they’re completely different. 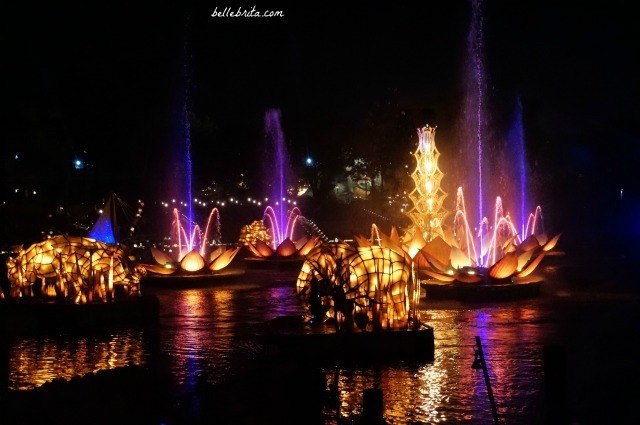 Rivers of Light is not a fireworks show, but it is an incredible light show with music and water. It’s honestly hard to describe, but Dan did take some gorgeous photos! I didn’t even edit the photo below. 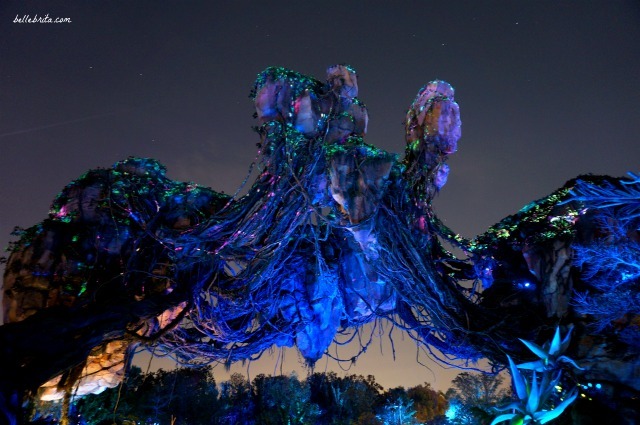 My one regret is that I wish Dan and I had paid more attention to Tree of Life Awakenings. I didn’t realize that it happened throughout the night and only lasted ten minutes each time. If I had, I would have insisted we watch the whole thing early in the evening, when it first got dark. As it was, we watched about three minutes on our way out the park, once we were already exhausted. For anyone who complains about the high price of admission to Disney World, definitely consider the quality of their shows. What would you pay to see similar shows? Animal’s Kingdom’s attractions are a mix of rides and walk-through experiences. Dan and I had FastPasses for Expedition Everest and Kilimanjaro Safaris. Aside from the shows mentioned above, we also enjoyed the Maharajah Jungle Trek, barbecue snacks at Flame Tree Barbecue (twice! ), and the flamingos near the front of the park. We also played Pokémon Go since we were in Animal Kingdom for Community Day. Guess who caught a shiny Bulbasaur! Expedition Everest is one of the best Disney roller coasters of all time. The Star Wars version of Space Mountain in Disneyland is probably my favorite, but Expedition might be my second-favorite. Dan and I first rode it together with a FastPass. We loved it so much that we immediately jumped in the Single Rider line (20-minute wait!) to go again. And later in the evening, we found the time to wait in the Single Rider line one last time to enjoy nighttime views of the park. Careen through the Himalayan mountains on a speeding train while avoiding the clutches of the mythic Abominable Snowman. Why is it so good? First of all, the theme is excellent. The queue is so immersive and really builds up the story. Even the ride itself allows you to suspend disbelief and feel like you’re actually on an expedition gone wrong. Second, the roller coaster is genuinely thrilling. Disney parks are not known for their thrill rides, so it’s nice to ride a legitimate roller coaster. Finally, this ride has great views of the park. I highly recommend riding it during the day and the evening for different perspectives of the park. Kilimanjaro Safaris is like a private behind-the-scenes tour of a large zoo. I assume the rough terrain is an attempt to make it feel like a real safari ride, but it definitely just felt like an awesome zoo experience. Still cool. Highly recommended. Ride off in an open-air vehicle for a day or evening tour of a lush African savanna, home to real-live exotic animals. I booked our FastPass for Kilimanjaro Safaris to correspond with sunset, which worked out beautifully. Maharajah Jungle Trek is even more like a zoo experience, but again, an awesome zoo experience. Embark on a self-guided walking tour of Southeast Asia—home to tigers, dozens of bird species, a flying fox and a Komodo dragon. We were there when a cast member was feeding the birds, which was really fun to watch. Even though a bird pooped on me. That was not fun. Also, for anyone skeptical of the value of Animal Kingdom because I’m comparing certain attractions to zoos… I’ve been to some phenomenal zoos with their own immersive themes. This comparison is a compliment to my favorite zoos for creating lands as detailed as Disney’s! Who else is ready for their next Disney vacation? 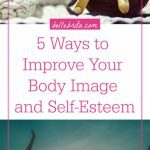 Just working on this post made me eager to visit Disney World again! If you’ve been to any of the Disney parks before, would you visit again? Why or why not? If you’re like Dan and me, and go as often as your budget allows, what’s the best part of revisiting the Disney parks? Leave your magical thoughts in the comments below!